This article is about the type of graphic symbol. For chromosome ideograms, see Cytogenetics. For the rhetorical device, see Ideograph (rhetoric). An ideogram or ideograph (from Greek ἰδέα idéa "idea" and γράφω gráphō "to write") is a graphic symbol that represents an idea or concept, independent of any particular language, and specific words or phrases. Some ideograms are comprehensible only by familiarity with prior convention; others convey their meaning through pictorial resemblance to a physical object, and thus may also be referred to as pictograms. "No dogs allowed" sign in Spain. The dog illustration is a pictogram. The red circle and bar is an ideogram representing the idea of "no" or "not allowed". In proto-writing, used for inventories and the like, physical objects are represented by stylized or conventionalized pictures, or pictograms. For example, the pictorial Dongba symbols without Geba annotation cannot represent the Naxi language, but are used as a mnemonic for reciting oral literature. Some systems also use ideograms, symbols denoting abstract concepts. The term "ideogram" is often used to describe symbols of writing systems such as Egyptian hieroglyphs, Sumerian cuneiform and Chinese characters. However, these symbols are logograms, representing words or morphemes of a particular language rather than objects or concepts. In these writing systems, a variety of strategies were employed in the design of logographic symbols. Pictographic symbols depict the object referred to by the word, such as an icon of a bull denoting the Semitic word ʾālep "ox". Some words denoting abstract concepts may be represented iconically, but most other words are represented using the rebus principle, borrowing a symbol for a similarly-sounding word. Later systems used selected symbols to represent the sounds of the language, for example the adaptation of the logogram for ʾālep "ox" as the letter aleph representing the initial sound of the word, a glottal stop. 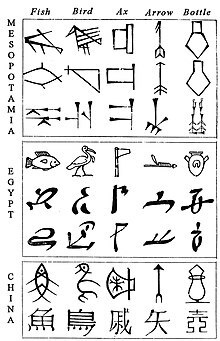 Many signs in hieroglyphic as well as in cuneiform writing could be used either logographically or phonetically. For example, the Akkadian sign AN (𒀭) could be an ideograph for "deity", an ideogram for the god Anum in particular, a logograph for the Akkadian stem il- "deity", a logograph for the Akkadian word šamu "sky", or a syllabogram for either the syllable an or il. Simple ideographs (指事字 zhǐshìzì) are abstract symbols such as 上 shàng "up" and 下 xià "down" or numerals such as 三 sān "three". Semantic compounds (会意字 huìyìzì) are semantic combinations of characters, such as 明 míng "bright", composed of 日 rì "sun" and 月 yuè "moon", or 休 xiū "rest", composed of 人 rén "person" and 木 mù "tree". In the light of the modern understanding of Old Chinese phonology, researchers now believe that most of the characters originally classified as semantic compounds have an at least partially phonetic nature. An example of ideograms is the collection of 50 signs developed in the 1970s by the American Institute of Graphic Arts at the request of the US Department of Transportation. The system was initially used to mark airports and gradually became more widespread. Mathematical symbols are a type of ideogram. Inspired by inaccurate early descriptions of Chinese and Japanese characters as ideograms, many Western thinkers have sought to design universal written languages, in which symbols denote concepts rather than words. An early proposal was An Essay towards a Real Character, and a Philosophical Language (1668) by John Wilkins. A recent example is the system of Blissymbols, which was proposed by Charles K. Bliss in 1949 and currently includes over 2,000 symbols. ^ Ramsey, S. Robert (1987). The Languages of China. Princeton University Press. p. 266. ISBN 978-0-691-01468-5. ^ Boltz, William (1994). The origin and early development of the Chinese writing system. American Oriental Society. pp. 67–72, 149. ISBN 978-0-940490-78-9. ^ Symbols and signs, AIGA. ^ Rotman, Brian (2000). Mathematics as Sign: Writing, Imagining, Counting. Stanford University Press. ISBN 978-0-8047-3684-8. ^ Unger (2003), pp. 13–16. Wikimedia Commons has media related to Ideograms.